Vacation rental villa. Sleeps 12, 3 bedrooms, 3.5 bathrooms. No pets allowed. Peace On The Green is a 2700 sq foot luxury villa located on the 18th Green at The Ledges Golf Club. 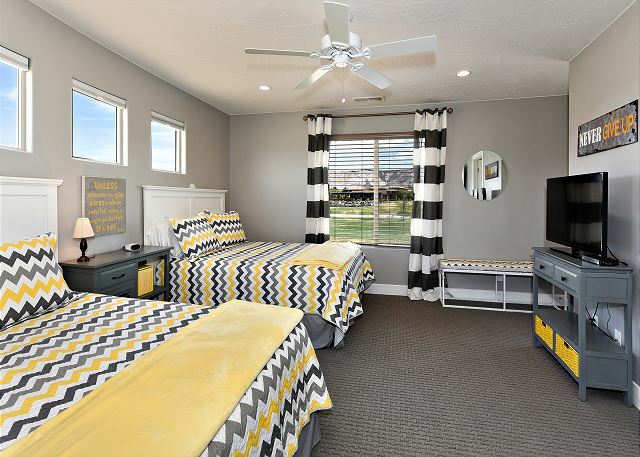 The surrounding landscapes, views of Snow Canyon State Park, spacious rooms, and expansive roof patio make this home a premier destination for your next vacation. The views from the Upstairs Patio overlook the cliffs of Snow Canyon and the neighborhood amenities. Back patio includes patio chairs, swinging chair BBQ grill. 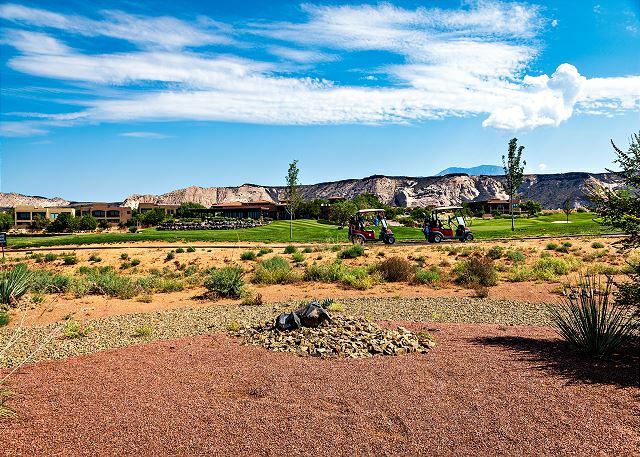 The vies from the Back Patio overlook the 18th hole at The Ledges Golf Club and the majestic sandstone mountains of Snow Canyon State Park. Directly behind our home is the clubhouse for The Ledges Golf Club, which includes a wonderful restaurant named The Fish Rock Grille. 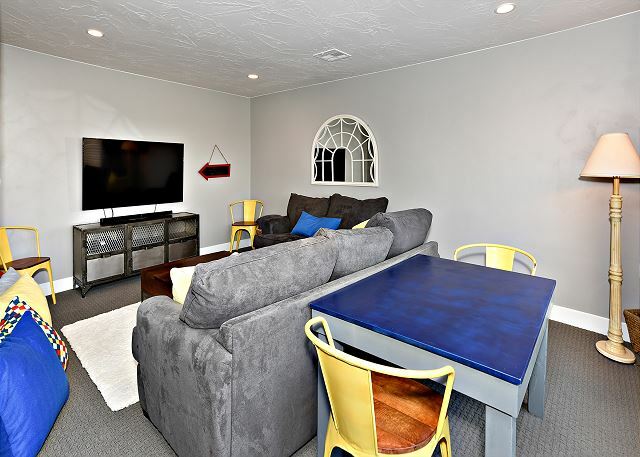 The Living Room is conveniently located next to the Kitchen and provides captivating views of the 18th green and surrounding landscapes at The Ledges Golf Club. You can also access the BBQ on the back patio to grill your favorite foods. 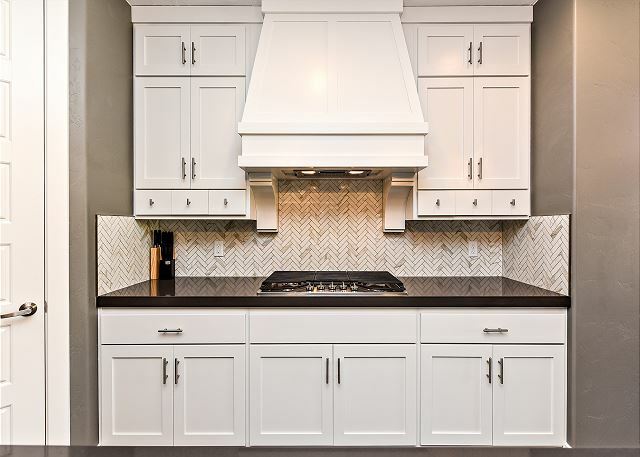 With all the upgrades and top-of-the-line stainless steel appliances, the Kitchen is fully stocked and ready to accommodate any meal preparations you desire. The dining room table and bar can accommodate up to 12 people and have plenty of room to enjoy meals together during your stay. 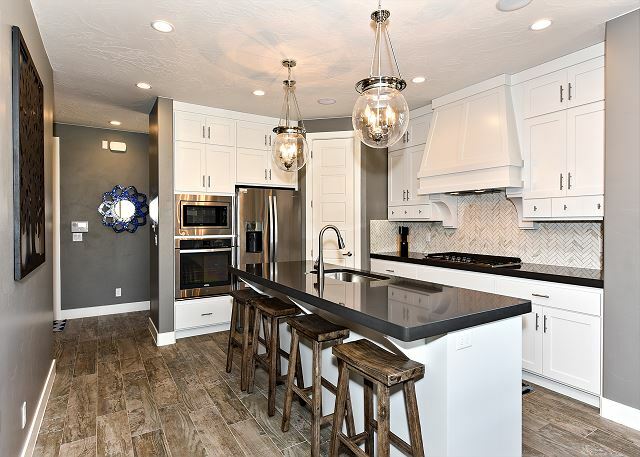 The Kitchen Stove and stunning counter-tops make meal preparations a breeze. 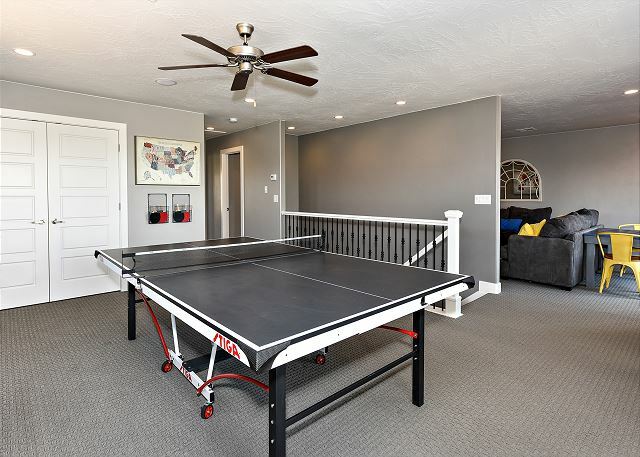 The upstairs recreation room includes a ping pong table and a video gaming console if you're in the mood for some friendly competition. 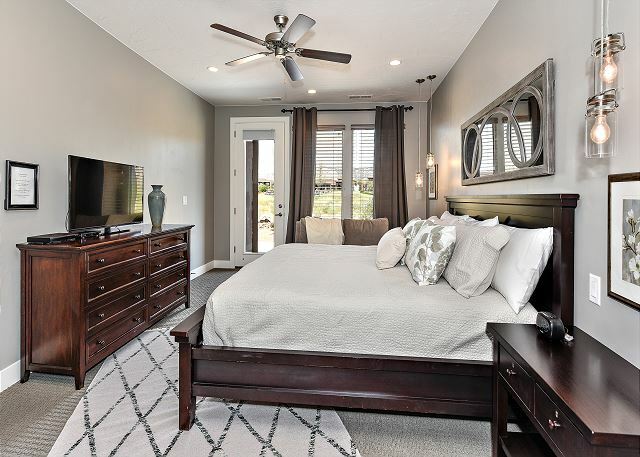 The spacious and beautifully decorated Master Bedroom will make you feel like royalty. 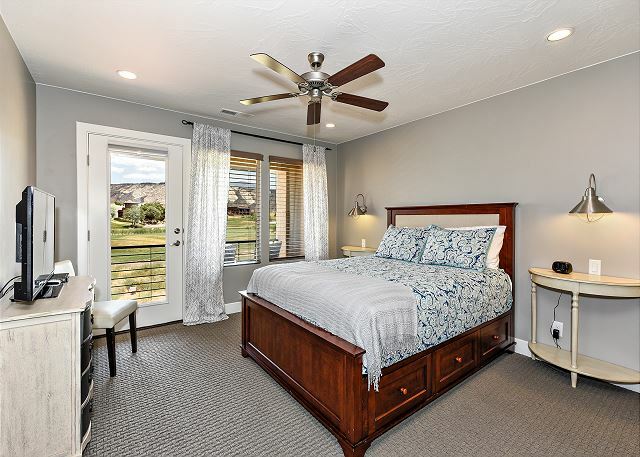 With a king bed and walk-out patio overlooking the 18th Green at The Ledges Golf Club, you are sure to have a memorable experience during your stay. 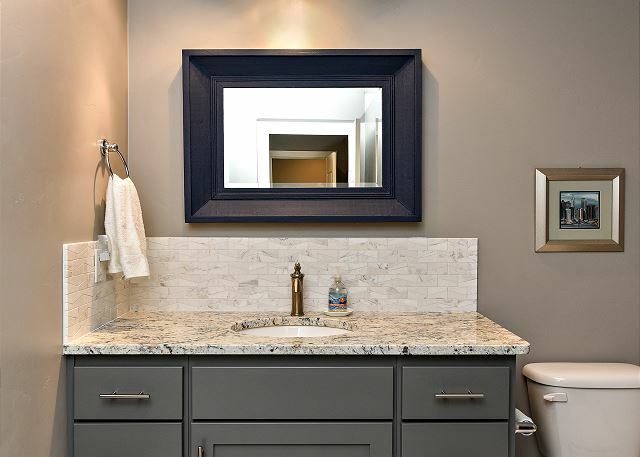 A view of the Master Bathroom vanity and sinks. 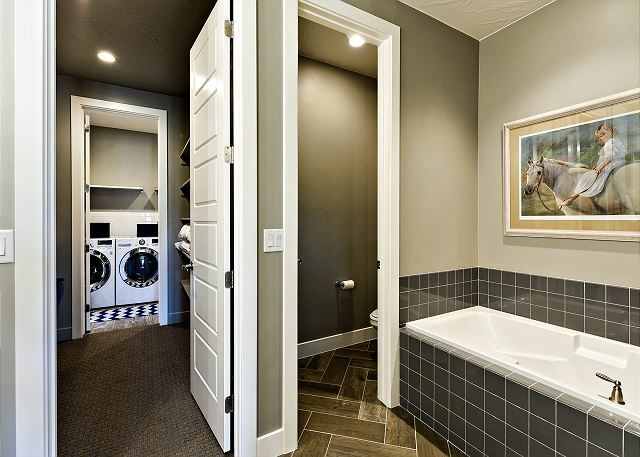 View of Master Bathroom, Walk-In Closet, and Laundry Room access. 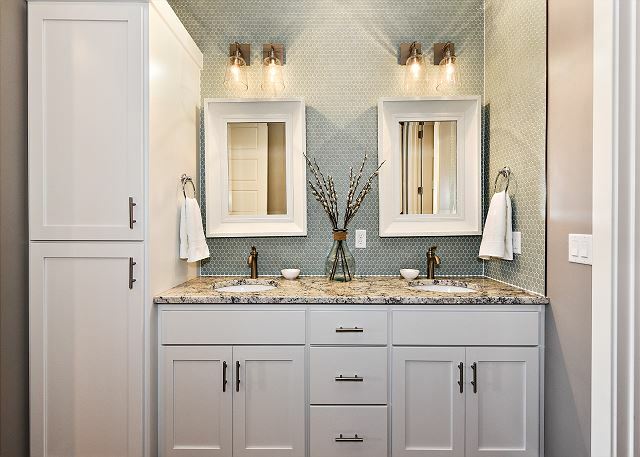 The Master Bathroom includes a full-size bath and walk-in shower for your convenience and enjoyment. Bedroom 2 is furnished with 2 Queen beds and can comfortably sleep 4 individuals. You can also access the Covered Balcony to sit and enjoy a stunning Southern Utah sunset. 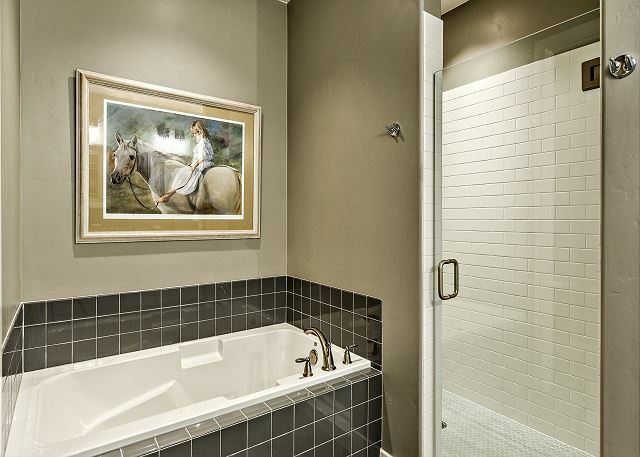 The second Bedroom has its own adjacent bathroom that includes a bath, toilet, sink, and vanity. 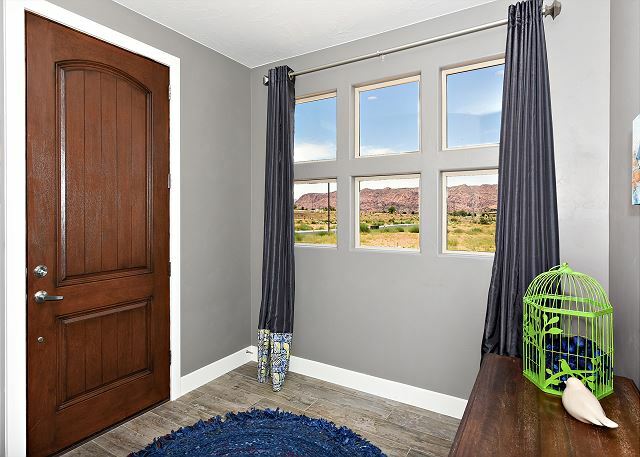 Bedroom 3 is furnished with a Queen bed and gives you unbeatable views of Snow Canyon State Park through windows and access to the covered balcony. 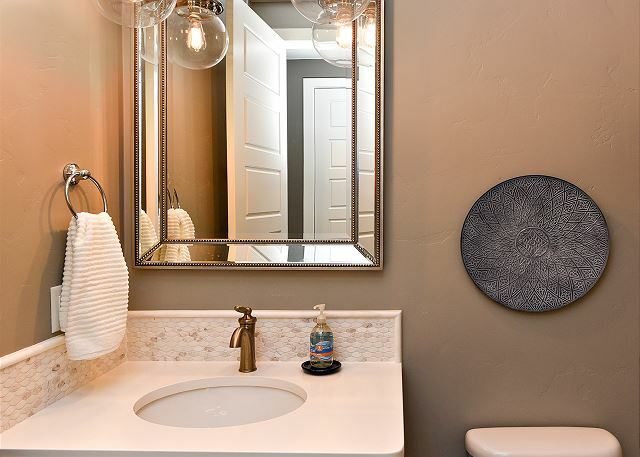 The downstairs common areas share this Half Bathroom located adjacent to the Laundry Room. From the second you step foot in Peace On The Green, you feel that you have arrived in paradise. 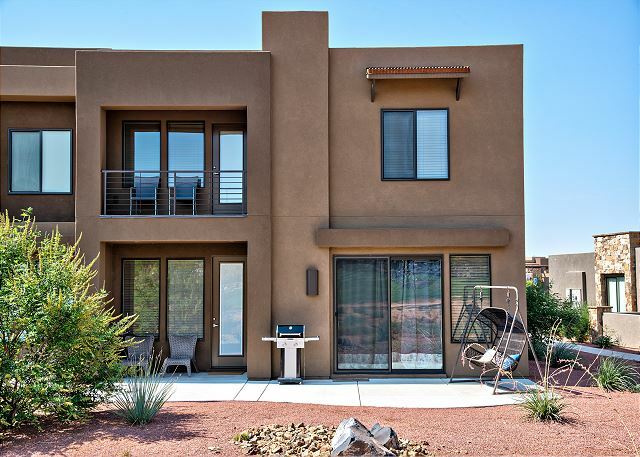 Peace On The Green is a 2700 sq foot, 3 bedroom luxury villa furnished with all the upgrades you could ask for including flat-screen HDTV's, granite countertops, and stainless steel appliances. 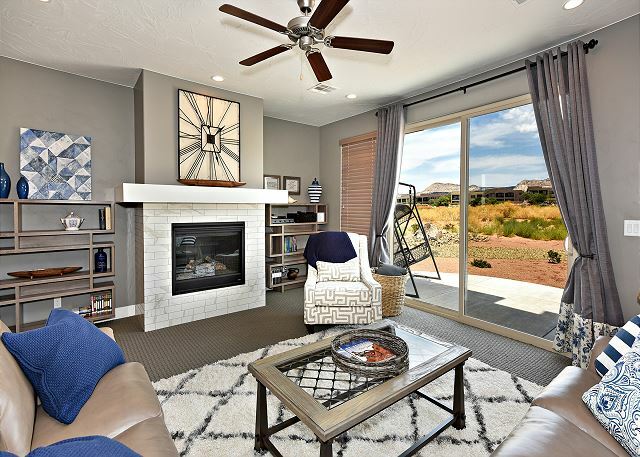 The floorplan is spacious with bedrooms that are quiet and private. Whether you're looking to relax or spend your day enjoying the surrounding landscapes you can rest comfortably in the contemporary style bedrooms, partially covered outdoor patio, or spend time with family and friends in one of the three family/recreation rooms, which includes a ping pong table and video arcade console. Sylvain- we appreciate you always choosing The Ledges for your long term stays. Its n honor having you and we will always make space for your return. Thanks again for staying and we look forward to your next visit. Home exceeded our expectations! New home interior design exceptional. Location on the golf course and across from pool & pickleball was perfect. Walking distance from Pro Shop. Loved the area and St. George so beautiful! Marcie, Thank you for choosing to stay with us at The Ledges. We appreciate you taking the time to review us. We are happy to hear that you loved the home and the amenities we have to offer. We look forward to helping you again in the future. Thank you, from all of us at The Ledges. 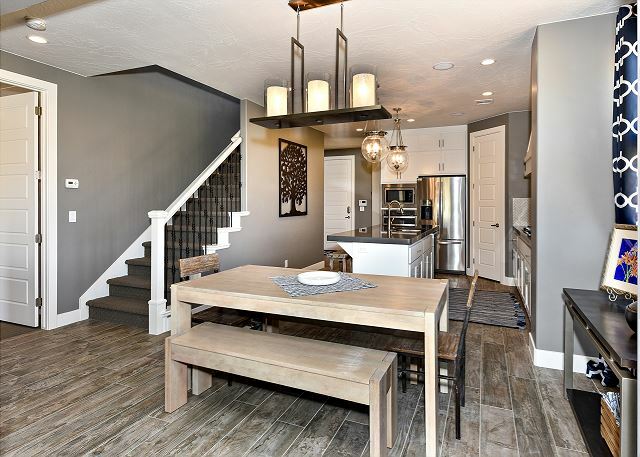 We loved this clean and modern home! The location was right on the golf course and across from the pool and pickle ball courts. It was clean, modern and everything worked wonderfully. Highly recommend this home! Kendria, Thank you for choosing to stay with us at The Ledges. We appreciate you taking the time to review us and are happy to hear that you loved the home and enjoyed the amenities we have to offer. We look forward to helping you again in the future. Thank you, from all of us at The Ledges. development. Did hear some highway noises on the porch at night but only noticed them after stargazing in the absolute quiet of the Canyonlands National Parks, and the proximity of the town was more important to us. Overall this was a perfect vacation rental for us and we would love to stay here again. Emmanual and Lisa, We are so happy that you chose to stay with us at The Ledges for your family vacation to southern Utah. We are pleased to hear that your overall experience was a great one and that you truly enjoyed your time spent here. We appreciate your kind response in regards to the home and all of the amenities it has to offer. 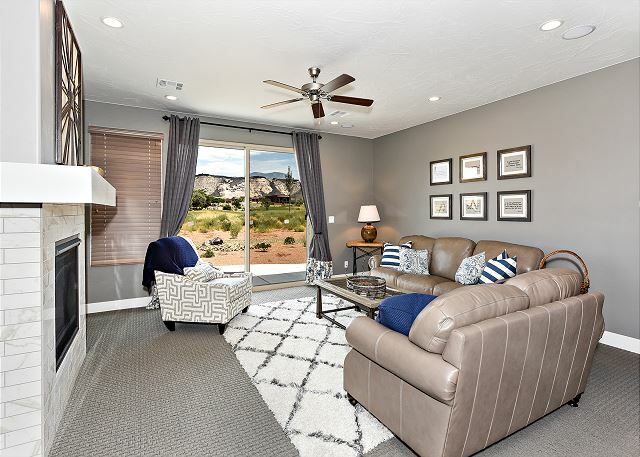 We are glad that you took advantage of the beautiful surrounding areas of Saint George such as Tuacahn amphitheater and all of the national parks, as well as the pool and pickle ball courts near the home. We also appreciate your kind response of our staff and customer service. Please know that you are welcomed back anytime, we hope to see you again soon! Thank you again, from all of us at The Ledges. Beautiful place to stay and immaculate. Cindy, thank you for coming to stay with us here at The Ledges. It was a pleasure having your family and we appreciate your feedback. Please know you are welcome here anytime! If we can ever be of assistance please dont hesitate to contact us. Thank you from all of us here at The Ledges. Edward, we are happy you enjoyed your stay with us here at The Ledges. We hope to see you again in the future! Thank you, from the Ledges staff. We had a wonderful week in St. George! The house was very comfortable. It was very clean and well kept. The kitchen was very well stocked. Our only complaint was the cupboards were built with only really TALL people in mind. Our 6’8” friend would have really liked them. Even though we were all adults this would be a great unit for families with kids. Even though we shared a common wall with neighbors with children we never heard them, good sound. proofing between units. Even though the location was a bit out of town it is close to the north entrance to Snow Canyon SP which is a must if you go to St. George. Also, if you are a golfer, which we aren’t, this unit backs up to the course. The description of the property can’t begin to do it justice! Friends that visited us from the Phoenix area were so impressed that they hope to bring their son and his family here in the future. Mary, we appreciate your kind words about the property and the amenities here at The Ledges and surrounding areas. We are happy to hear that you enjoyed your stay and hope that you will return in the future. Thanks again, from all of us here at The Ledges. The place was beautiful, spacious- I would stay every time in St George. Randall, thank you so much for coming to stay with us here at The Ledges. We are so happy that you enjoyed your stay & hope you made some wonderful family memories. Please know you are welcome back here anytime! If you ever need anything, please don't hesitate to call. Happy New Year from all of us here at The Ledges. This rental was so perfect for our family. We wanted to stay together as a family as we were in St. George for a family wedding. The children were happy with game room & pool. We all loved this property. Roy, thank you so much for coming to stay wit us here at The Ledges. It was a pleasure having you all and we appreciate your honest feedback of this luxury vacation villa. Please know you are welcome back here anytime, and if you need anything, please don't hesitate to contact us. Thanks again from all of us here at The Ledges. We were very happy with the condo unit. It fit our family's needs perfectly. The area is beautiful, and there is a lot to do, if you are into hiking, biking, and enjoying desert/mountain scenery. Golf and tennis is also available. The staff at the rental office was friendly and efficient. We would definitely return if future plans include the St. George area. Lyn, thank you so much for coming to stay with us here at The Ledges. You were such a pleasure to work with and we want you to know how much we appreciate you staying. Please know that if your travels bring you this way again, we want you to stay with us. Thank you again from all of us here at The Ledges. This is an excellent vacation destination. Great accommodations with game room and nice balcony overlooking the pool area. Enjoyed golfing, swimming, sightseeing (nearby canyons) and morning walks along the bike trails. Also enjoyed sitting on the patio overlooking the 18th green. Saint George has some great places to eat, George’s Corner, Irmita’s Casita, Cliffside Restaurant and Anasazi Steakhouse to name a few. Thanks again to Dan Dekker for his help, it was a pleasure working with him. Mr. Lopez, thank you again for coming out here to The Ledges. Dan mentioned what an awesome group you guys were to work with & we truly appreciate you. Please know you are welcome back here anytime and we start planning your 2019 trip already :) Thanks again for everything from all of us here at The Ledges. 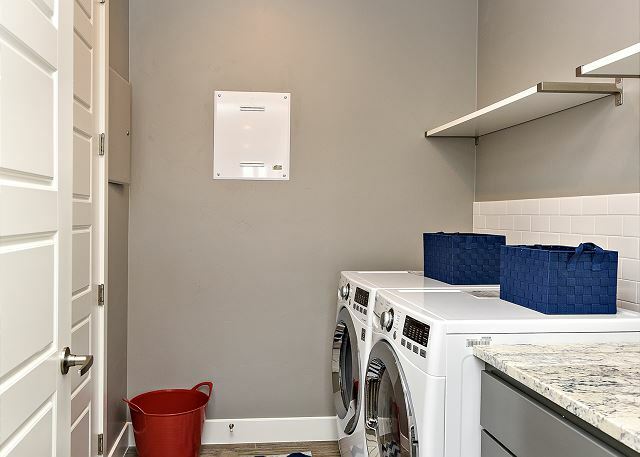 Well designed, spacious, corner unit full of amenities and FUN! Spacious, clean, superb, tasteful interior decor, bedding, furniture, bright kitchen, fully equipped with dishes, condiments, toiletries, even wired for sound with in ceiling speakers, very clean, towels for pool, gas fireplace, NO TV in downstairs livingroom by kitchen and patio, TV is upstairs adjescent to game room and massive balcony. Also TV is every bedroom. Superb property, largest of all the other units our friends stayed at. Keypad lock no need for key. Property manager attentive and responsive. Ivan, thank you for staying with us here at The Ledges. It was an honor having you and your family. We are so pleased to hear that you enjoyed this beautiful vacation villa and also appreciate your honest feedback. Please know you are welcome back here anytime! We hope you all made some amazing memories and look forward to having you back. Thanks again from all of us here at The Ledges. 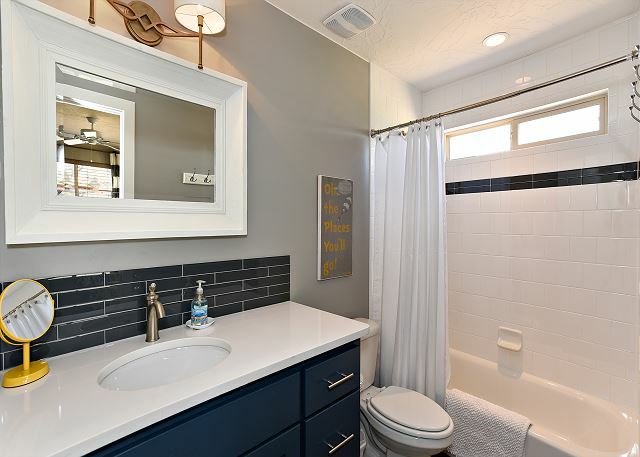 Beautiful and extremely clean property! Came with a group and we had a fantastic stay. Close to Zion National Park. Looking forward to coming again. Deena thanks so much for coming to stay with us here at The Ledges. We appreciate your feedback and so glad your group had a great time. Please know you are welcome back here anytime. Our property manager appreciated how wonderful your group was and we look forward to having you back! Best wishes from all of us here at The Ledges. excellent location and lot's of fun for a wedding. Thank you for coming out and staying with us here at The Ledges. We truly appreciate the opportunity to host the wedding and look forward to having you back. Spent several days at this beautiful home. It was perfect. Great location across the community pool. Very quiet and very clean. Property manager...Jeff...was extremely good to deal with. Thank You for coming to stay with us here at The Ledges. It was an honor having you and we look forward to having you back. After Holidays "Get a Way"
My wife and I thoroughly enjoyed the quiet, peaceful surroundings of the Beautiful community of the Ledges. The Home was just as the photo's indicated, clean, well maintained and a very comfortable home overlooking the 18th fairway. With a little dusting of hail and snow the view out the living room was fantastic...Can't wait to go again. The property Management staff was outstanding in helping to put our Get a Way package together and were available to assist us once we arrived. We are pleased to hear that you had such an enjoyable getaway and appreciate your kind words. Thank you for taking the time to write a review of your stay and for highlighting the beautiful surroundings and cleanliness of our home. We look forward to having you stay with us again! This is a beautiful place. Everything is new. Had a lot of amenities such as wireless, Directv and the ability for Netflix and Amazon. Views were incredible with great access to the clubhouse. Thank you for your review. We are pleased that you enjoyed the amenities and access to the clubhouse and hope to see you again soon! outstanding. beautiful. manager was great responding. Thank you for taking the time to write a review! We are pleased to hear you enjoyed your stay. This vacation home is amazing! Every attention to detail is included for those fortunate enough to stay here. Would highly recommend this home for future vacationers. You will feel as if you are staying in your own home as the owner has attended to every last detail ensuring the comfort for guests. Beautiful home!!!! Very clean and the views are lovely. Thank you for your review and we are thrilled you had such a wonderful weekend with us. We are pleased to hear you enjoyed the details of our rental unit and the beautiful surroundings at The Ledges. We look forward to having you stay with us again! Fun place - great surroundings! Ping pong, video games, golf, hiking, lunch at the clubhouse - it's hard to believe how much we packed into 2 1/2 days! Loved the novelty jigsaw puzzle with uniquely shaped pieces, too. The upstairs patio (over the garage) made a nice place to sit together in the evenings (too hot during the day). The clean-up expectations made an early departure somewhat challenging, though. Apart from that, it was a very nice experience, well-managed by the staff, and thoroughly enjoyable for guests. Thank you for your review and for discussing the many highlights of your stay with us. We are glad to hear you enjoyed the various amenities and nearby surroundings at The Ledges. We hope that you will stay with us again during your next visit to St. George! I and three friends stayed for two days at Peace on the Green. It was a lovely house--fully appointed, with comfortable furniture and bedding. I'ts a little weird to have the golf course literally right outside the back door but we were there when it wasn't at all busy and the golfers were very respectful so it was no problem. We weren't interested in the golfing aspect of the Ledges but obviously if you are you will love the location. It's not too far from Zion, but not exactly right there either. But it is certainly a convenient drive. Overall I would highly recommend this place. Thank you for taking the time to write a review of our vacation rental. We are thrilled to hear you thoroughly enjoyed your stay and the accommodations! The place was clean, easy to get to and very comfortable. Thank you! We are pleased to hear you enjoyed your stay! Thank you for your excellent review and for highlighting the comfort of our rental unit. Very comfortable and quiet. 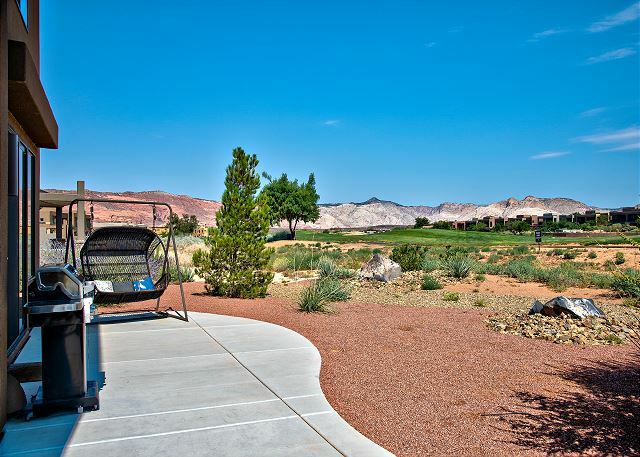 On golf course with views of Snow Canyon. Thank you for your review. We are glad to hear you enjoyed your stay!